The East Yorkshire based Port City, Hull is one of the best placed cities in the UK when it comes to its location being very accessible by land and by water. The sea or river port (River Hull) in the city allows for much of the water traffic in or out of the city and the vast network of roads makes it possible for all those incoming goods to be transported away. The city is located about 140 Miles from Birmingham and Impress Blinds offers our elegant and beautiful windows blinds in the city to cover up windows elegantly with that unique design element bridging the gap between functionality and outstanding looks perfectly. We offer something for everyone both in terms of design and also functionality. Our large collection of different materials for windows blinds provide whichever combination that is needed and the beautiful designs in printed or style format, provide all the elegant touch your windows and walls need. Impress Blinds offers a unique and vast choice of styles and materials including our day perfect Vision Blinds that are made from composite materials with perforated surface designs in them that let in all the required daylight with freshness elements as well, the unique and privacy enhancing Vertical blinds that have vertical stripes of materials perfect for large wide windows, the beautiful and Cheap Roller Blinds enabling printed designs with one-piece materials available in all thicknesses for dark and cozy or bright and vivid interiors, the perfect Conservatory Blinds made specially with different materials for conservatory windows and doors and other beautiful options like the fabric made Roman Blinds, the elegant Wooden Blinds, lasting Metal Venetians or complete window shutting Velux and Shutter Blinds. Impress Blinds offers all these options in Hull City and more to make perfect sense of designs and functionality for our clients. Walls are usually plain and in one of a couple of color tones. The large canvas of these walls can be complemented perfectly with unique windows blinds in attractive colors, patterns, textures or designs. We offer a unique “Design Your Own” windows blinds service that lets our clients design their windows blinds just how they want in terms of printing or material designs. Whether it is the printed designs for Roller Blinds or Roman Blinds with the requirement of unique patterns and textures or you want a completely unique color and design combination with your Wooden Blinds or Vertical Blinds or you want to go full color specific with Metal Venetians or Conservatory Blinds, Impress Blinds provides all the different choices with our efficient blinds designing and manufacturing. A lot of average quality windows blinds providers in the UK and Hull more precisely, sell you windows blinds that you take away from them and have to fit yourself with measuring your windows for sizes by yourself as well. 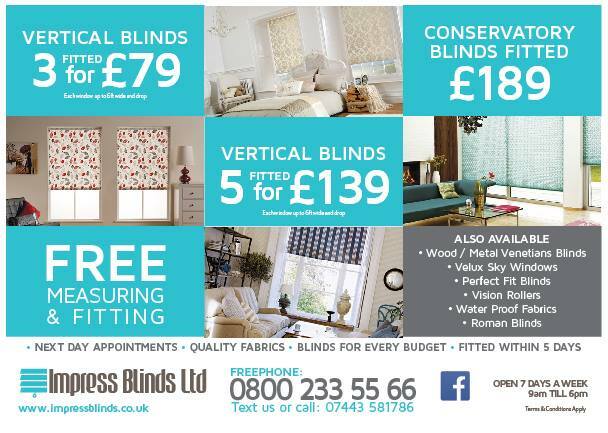 What makes Impress Blinds in Hull different is the fact that we offer free windows measurement service in the city that eliminates the chance of errors an average Joe might present by sending out skilled people who take into account any slightest variations in your specific windows and order just the perfect Made to Measure Window Blinds for your homes, offices or other types of buildings. Our major clients in Hull (UK) are much satisfied with our services.